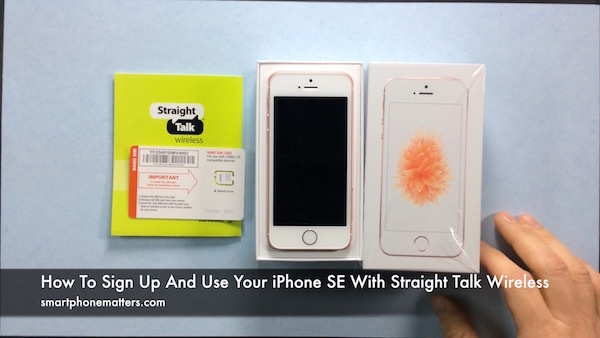 In this video I’m going to show you how to sign up for Straight Talk Wireless. Activate Your Straight Talk account with a new phone number. Jump to Is Your iPhone Compatible with Straight Talk’s Verizon Network? I am going to sign up for Straight Talk’s Bring Your Own Phone (or BYOP) plan using their verizon network and be using my Apple iPhone SE. The iPhone SE is a great choice for Straight Talk Wireless. Starting at $399 for the 16GB model, you can by a brand new SIM free iPhone from the Apple store that can be used with Straight Talk’s Verizon, AT&T, or T-Mobile network. While this iPhone looks like the iPhone 5s, the phone has most of the same features and specifications as Apple’s iPhone 6s. Here I’m going to show you how to pick a monthly plan. choose Shop > Plans > Wireless Service Plan. You’ll see a table of the different plans that Straight Talk offers. Most people choose the $45 30-Day Unlimited Plan. This plan includes 30 service days, unlimited nationwide talk and text, and your first 5 GB of cellular data are at high speed. After you use that first 5 GB of data, the speeds will be reduced to 2G speeds. With your high speed data, you’ll be able to do things like watch YouTube, Netflix, listen to Spotify, Pandora, or Apple Music. After you use that first 5GB of data, the speeds are reduced to 2G speeds. At 2G speeds you won’t be able to watch video or listen to streaming music, you’ll be able to maybe check email, visit some web pages, or send messages but it’s going to be slow. If you need high speed data, you’ll need to renew your monthly plan. Your high speed data will return after your next refill. Straight Talk recently started offering a $55 30 Day Unlimited Service Plan. It too has unlimited talk and text, but the first 10 GB of data are at high speeds before being reduced to 2G speeds. So you are getting an additional 5GB of high speed data for $10 a month. Straight Talk also offers a $60 Unlimited International Plan. This plan is similar to the $45 plan but includes international mobile to mobile and mobile to landline calling to Mexico. China, and other countries. Check the details on straighttalk.com because they update the list of countries you can call frequently. It comes with the first 5GB of data at high speed. I really want to stress how Straight Talk data plans work. You’ll have either 5GB or 10 GB of high speed data, after you use that up you’ll still have data, but the speeds are reduced to 2G speeds until you refill your plan. What about the rest of the plans here? The $30 plan cannot be used with the Bring Your Own Phone plan so this isn’t going to work with my iPhone SE. Straight Talk also offers 90, 180, and 365 day plans for $130, $255, or $495. With the 90 day you’ll save an additional $5 over the 30 day plan. For the $255 plan you’ll save $15 and the $495 plan you’ll save $45. I generally don’t recommend these plans. Your prepaying for service months in advance. This limits your options to switch to a different wireless company if for some reason you want to. But if the savings are worth it to you, they re an option. These plans may be an option if you want to give a smartphone with service as a gift. Straighttalk has a service called autorefill. Auto Refill lets straighttalk automatically charge your credit card each month to refill your service. You set up your account on straightalk.com, enter your credit card number, and they will charge you automatically. When you sign up for autorefill they have a special offer and a discount. You’ll save $5 the first three months and then $2.50 a month afterwards. This discount is only for the $45 and $60 plans, not the $55 plan. Also, when your on auto refill you’ll see an additional $1.79 in fees. There is a 911 service charge, a federal universal service charge, and regulatory cost recovery fee. That comes out to $1.79 in fees on my bill. So you’ll get the $2.50 discount but pay the extra fees. Is Your iPhone Compatible with Straight Talk’s Verizon Network? I want to use my my iPhone SE with Straight Talk’s Verizon network. So I’ll need to check that it is eligible. It should be, because it’s the SIM free model, but you still need to check it anyway. Click the button below to visit straighttalk.com. You can find the IMEI by dialing *#06# on your phone. The number will be displayed on the screen. It’s a long number, so enter it carefully. After a pause, you should see the message, Congratulations Your Phone is compatible. Now at this point you could click the Register and Activate button now, or you can order the CDMA LTE Activation Kit. That kit will include the CDMA LTE compatible SIM, Network Access Code, and a 30 Day Unlimited Plan Service Plan. Now I’ll show you how to order the CDMA LTE Activation Kit. Click “Choose Your Network Access Code”. From the shopping cart, click Proceed to Checkout. Finally, enter your shipping and billing information to complete your order. Once you have your CDMA LTE Activation Kit, you can sign up for Straight Talk. My kit came with the CDMA LTE Compabile Nano SIM card, Network Acccess Code, and a $45 30 Day Unlimited Plan service pin. For this phone, I am going to get a new number. To sign up for Straight Talk and keep your existing phone number, choose Activate My Straight Talk Service with a number from another company. If you choose this option, your stepss will be a bit different than what’s in the video. After you have verified your phone is compatible, click Register and Activate. You’ll see a prompt asking if your phone you are trying to bring to Straight talk currently active. My phone is not so I’ll click no. Now enter the number for your CDMA LTE SIM card. < That number is printed on the front of the plastic card the SIM is attached to. It's a long number, so enter it carefully. Here, you need to enter your IMEI number. You can see its already there because i entered it earlier. If you have a Service Plan PIN enter it in the Service Plan area. I entered my Service plan for the $45 30 Day Unlimited Plan. Create a new straighttalk.com account or login to your existing account. Now you have the choice to create a new straighttalk.com account or log into your existing account. I already have an account so I’ll log into my account. Finally, you’ll see here the steps to complete your activation. If you scroll to the bottom of the page, you’ll see buttons to email and print these steps. Now that I have finished signing up for Straight Talk Wireless’ Verizon network online, I need to set up my iPhone SE. 3. install any carrier updates when prompted to. First, I’ll remove the nano SIM from this plastic card and insert it in my iPhone SE. I’ll use a SIM tray extractor tool to remove the tray from my iPhone SE. Some phone’s come with this tool in the box. Look’s like my iPhone SE did. My iPhone 6 did not. If you don’t have the tool, a bent paper clip should do work too. When you put the SIM in the tray, make sure to align the notched corner of the SIM with the notch in the tray and insert the tray back in the iPhone. Now let’s follow straight talk’s instructions and restart the phone. Let’s see if we get a message to update the carrier settings. Now lets check phone calls. I have here as second phone this is a Nexus 5X. I’ll call my iPhone SE from this phone. You can see that I’m receiving the call. Now I’ll call the Nexus 5x from the iPhone SE. You can see the iPhone SE can make calls. Let’s check text messages. I’ll send a text message from the Nexus 5X to the iPhone SE. You can see I received the message. Now I’ll reply to that. You can see I was able to send a text message from the iPhone SE to the Nexus 5X. Let’s do that again, but this time send an MMS picture message. It’s summer time here so I went outside and took a couple photos for this. Let’s send this photo of a flower from the iPhone SE to the Nexus 5X. You can see that it was sent. Now I’ll send a photo of a flower from my Nexus 5X to the iPhone SE. You can see that it was received. Let’s check if I can use the Safari web browser and cellular data to visit smartphonematters.com. This may not work because I haven’t installed the APN configuration profile. Now ‘ll open Safari to see if I can visit smartphonematters.com. You’ll see I immediately got the pop up saying: “Could not activate cellular data”. This means I’ll need to turn on WiFi , install the APN profile . I copied the link into my iPhone earlier so I would not have to type it in. I’ll paste it into safari and follow the steps to install the profile. Tap install. Note that the profile isn’t signed. You can ignore this and continue to install it. Now I’ll turn off wi-fi and try to visit smartphonematters.com again. You’ll see it’s displayed so cellular data is working. Finally I’ll check that voicemail is working. I’ll call my iPhone SE from the Nexus 5x and leave a message. You can see I received the voicemail notification. Let’s try to listen to the message. And it seems that if you use Straight Talk’s Verizon network, visual voicemail works. Straight Talk doesn’t say they support it. You definitely don’t get it on Straight Talk’s AT&T network or their t-mobile network. Some ST Verizon network customers have told me recently they are having problems with it and now get regular voice mail. VVM is working for me here. Alright, you can see i am able to use my iPhone SE with Straight Talk’s Verizon network. Calls, text messages, picture messages, internet, and voicemail all work. The iPhone SE is an excellent choice for Straight Talk wireless. For $399, you can get a new iPhone with many of the same tech specs as the iPhone 6s. It’s not that easy to find new unlocked phones that you can use Straight Talk’s network so having the SE is a nice option. I have an iPhone SE Model A1662 on Verizon. It DOES take SIM card. Verizon is the only carrier that works where I live (which is why I chose straight talk). Straight talk keeps telling me it isn’t compatible. It has a clear history with Verizon! Any ideas?? Yea. I did. Carrier Update TFW 24.2 and iOS 9.3.2 with Straight Talk On My iPhone 6. Seems OK. My upload speeds were fastest later.